I got a box in the mail today, and my mood lit up when I saw the name on the return address: Tim Guard. 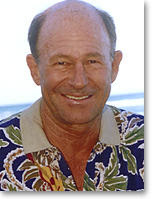 Robert T. “Tim” Guard is in his public life the president of one of Hawaii’s oldest and most respected corporations, McCabe, Hamilton & Renny Co., Ltd. In his spare time, he’s a key member of the Navy League in Hawaii, a director for the Pacific Marine Life Foundation, and he's adopted our ship and her crew. But, while impressive in their own right, these are among what we aboard RUSSELL think are his least accomplishments. You see, Tim once served as a naval officer and won a Bronze Star for his service to our Navy and Nation in Vietnam. 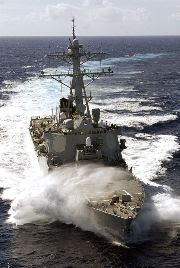 It is by no means enough that an officer of the Navy should be a capable mariner. He must be that, of course, but also a great deal more. He should be as well a gentleman of liberal education, refined manners, punctilious courtesy, and the nicest sense of personal honor. He should be the soul of tact, patience, justice, firmness, kindness, and charity. Tim Guard pretty much exemplifies that and provides a goal for which we should all strive. So, this post’s for you, Tim. On behalf of the officers and crew of RUSSELL, mahalo. I'd like to work out something with you as far as collecting and sending letters to you guys while you're deployed. Is there a way to contact you or your PAO? Are you folks aware that Baen Books (fantasy, SF, some military/technothriller) will provide electronic access to their online catalog for free for military? Especially deployed military? Take a look at their website or e-mail me for details. There are several hundred titles available, in multiple electronic formats. Send me an e-mail (my address is on my profile page), and we'll see what we can work out. I can tell you for a certainty, that John Ringo writes some of the best sci-fi since the early days of sci-fi. Think Clark, Assimov and Heinlein (before he groked) all rolled together. And the Kildar series ROCKS! Kildar by the way, is about a medically retired SEAL who goes on to do some pretty interesting things: Think good looking women, high body count, and a damn fine yarn to boot. Baen offers pretty much everything except for the books currently in hardback free, unless I'm mistaken. And hat's off to Tim, who never did take off the suit, and when he wore it, he wore it like it was skin.